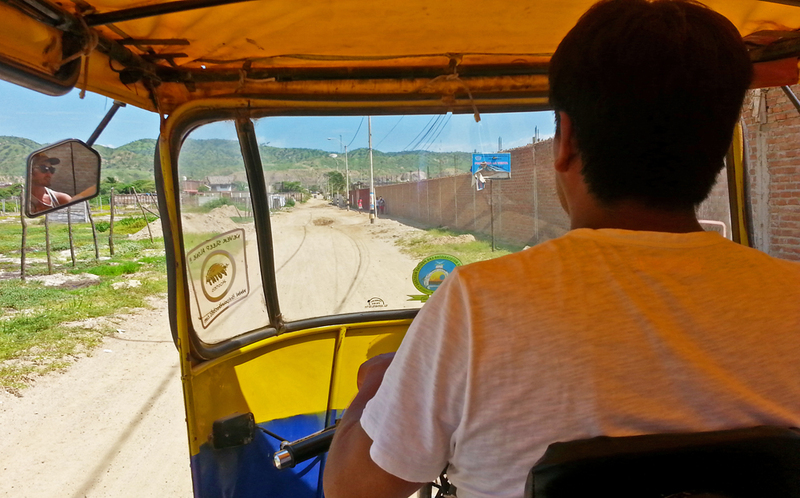 I climbed in a Volkswagen van, pulled the door shut, and settled in for the 6 hour ride to Peru. 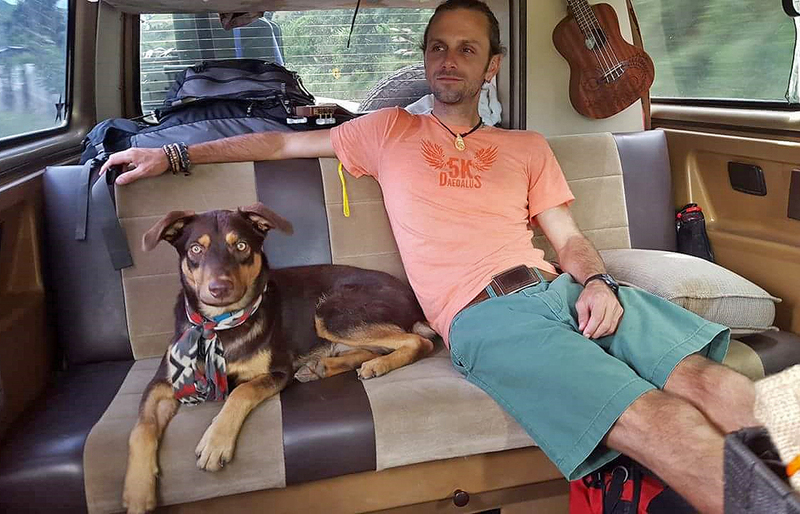 After backpacking South America for 2 months and I finally felt at home in a Westfalia campervan. 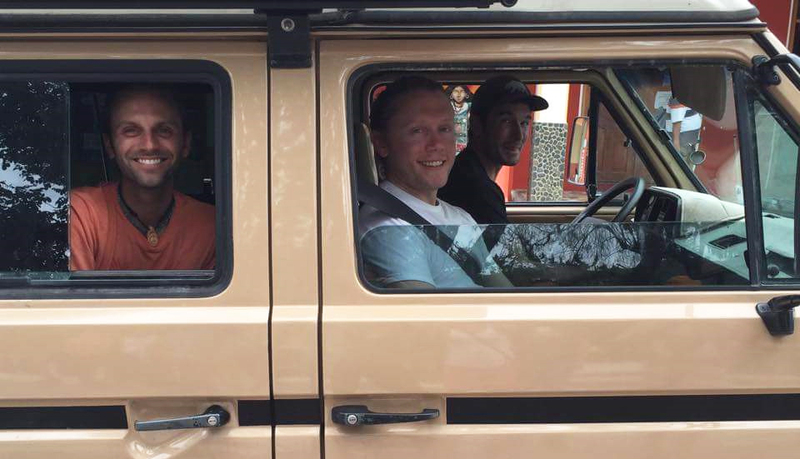 I’d enjoyed hanging out with Ben and Brian for two weeks in Vilcabamba, Ecuador and took them up on their offer to ramble south in Ben’s van to Peru. After saying goodbye to our friends in Ecuador we were off on a good ole’ South American road trip. We wound around curvy mountain roads, through thick cloud forests, and past mudslides covering half of the highway. Just after sunset we finally crossed the border from Ecuador to Peru, and then back into Ecuador, and then back into Peru, and back to Ecuador, and finally into Peru for good. It turns out crossing an international border with a van is not quite as easy as clearing customs with a backpack. We drove south along the Pacific Ocean in Peru after dark, Ben zigging and zagging to avoid colliding with the throngs of tuk-tuks. Famished, we pulled off the highway to grab a fish dinner at a hole in the wall restaurant by the beach. Northern Peru has huge black beetles that come out after dark and we sat eating fresh fish as the beetles climbed the table legs and fell into our laps. Eventually we found a hostel with room for us and the van. We checked in, grabbed a few beers, and walked out the patio door to put our feet in the sand. Fresh fish dinner? Check. A hostel on the beach? Check. All for less than we spent in Ecuador? Check. Peru was definitely going to be fun. 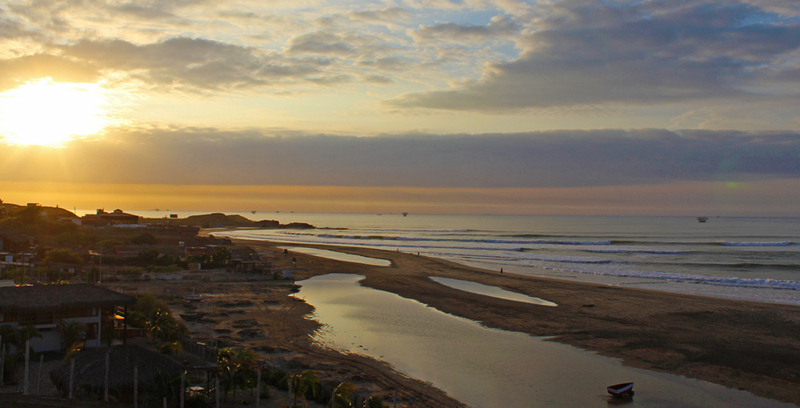 The next day we made our way to Máncora, a hippie surf town on the Pacific Ocean. The area turned out to be the rawest place I’ve ever been with dirt roads leading to dead-ends comprised of large heaps of dirt, huge craters where the road used to be, or walls cutting off our path. We crisscrossed the town, found our beach hostel and checked in. The hostel had a pool, plenty of cold beer, and a tuk-tuk to take us to the center of town, pretty much all we needed. We hung around Máncora for a few days, surfing, drinking beers, and running around town. The party atmosphere was fun, but we were ready for a laid back beach town to relax in, so we packed up and prepared to head south. 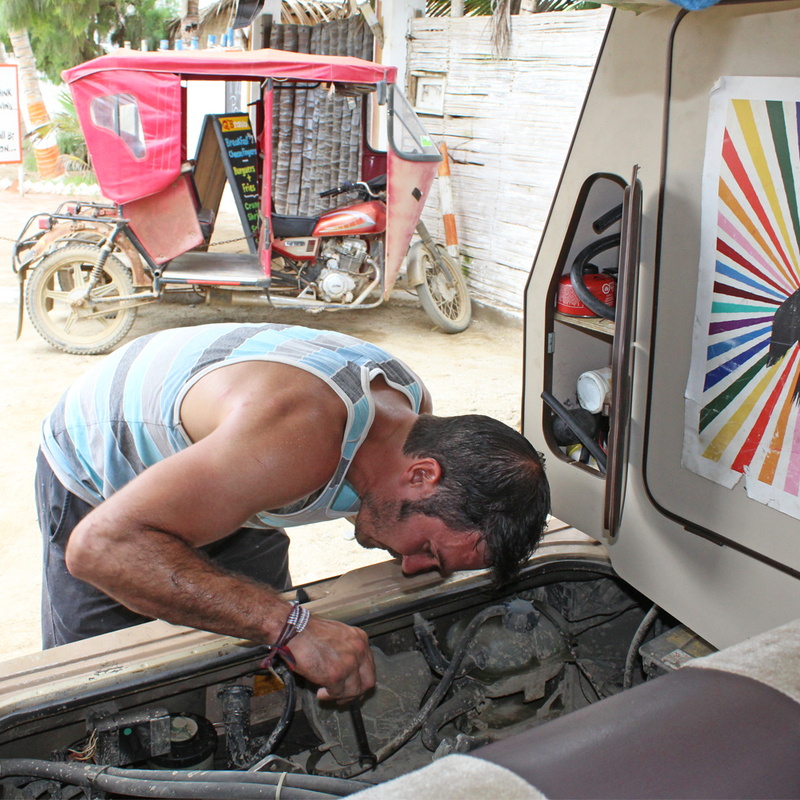 Before we left town Ben and I worked on the van’s engine, fixing the alternator mount and adjusting the spark plugs, a great refresher course for when I return to the United States and get back into my own van. 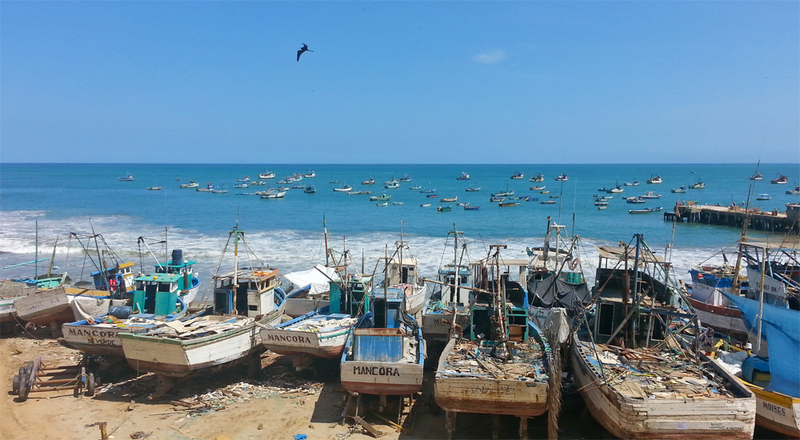 We drove south to Lobitos, Peru, an epic surf spot that is not easy to access. We passed through several checkpoints and traversed dessert dunes and dirt roads to get to a small sandy town with a surf break. We found a hostel and checked in. Unforutantly, the hostel had not received the weekly water supply and the bathrooms were out of order. The staff compensated us with a free beer, which I gladly accepted. Once we were settled in we walked down the beach to one of the two restaurants and had dinner. While eating the lights flickered and went dark. The entire town lost power. We returned to a hostel with no water or power, but had a great night sitting by the fire on the cliffs overlooking the beach jamming out to music and drinking box wine. The next morning I woke up, had breakfast, and packed my bags. I’d enjoyed hanging out with the guys, but it was time to head south, grab a flight to Lima, and meet my girlfriend for a week of adventures together. I walked to the center of the dusty town and waited for a packed collectivo van to drive me to the nearest real town. There I found a 2 hour bus to Piura, Peru where I caught a flight to Lima. When I met Brandy in the airport I smelled like saltwater, had sand in places I never knew I could, and was in dire need of a shower, but she was still happy to see me!